Well, I’ve gone and done it: I signed up to attend the Origins convention this year. I had a lot of fun last year, even if I did lose almost every single Advanced Squad Leader game that I played. I haven’t decided exactly how my time at Origins will be divided up this year, but I do have one specific goal: I want to play a Monster Wargame of some sort. 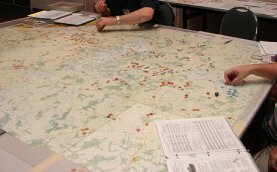 By “Monster Wargame,” I’m referring to a wargame of that a) has a mapboard so big that it must be spread across several game tables; b) makes use of more tiny cardboard counters than there are stars in the sky; and c) normally requires several years of regular play to complete. This is an experience I’ve not yet been able to enjoy–I live in an apartment that lacks the prerequisite Gaming Basement, and if I left a complex wargame set up overnight our cats would almost certainly scatter it to the four winds. World in Flames, a World War 2 grand strategy wargame that meets most of the requirements above. The maps look particularly glorious when they’re sprawled across my apartment floor. (That’s as close as I’ve gotten to playing full-blown WiF; I always have to hastily roll up the maps and let the cats back out of the locked bedroom before my wife gets home.) A wargaming friend of mine who will be attending Origins owns a copy of Pacific War, which would certainly also qualify for the Monster WW2 Wargame category. I know some Federation & Empire players who will be attending Origins, and who might let me join their game (perhaps as one of the minor races, so that I couldn’t do too much damage to the cause–Seltorians, your time has come!). There are certain Star Fleet Battles scenarios so massive in scale that I simply refuse to believe that anybody has actually played through them–one of those might be a good choice. Given that I’ve played 4-ship SFB games that lasted for eight hours, I cannot imagine how long it would take to work through a 30-ship showdown, especially when my mind tries to imagine how many drones and fighters would probably be out on the map at any given time. Likewise, I believe that with the Red Barricades ASL expansion, which I own, one could conceivably recreate the entire battle for Stalingrad on a squad-level scale. The mind trembles at the thought. In short, there’s lots of options. Whatever I play, as long as it features a gi-normous mapboard, I’ll have fun. And as long as there’s a steady supply of Mt. Dew within easy reach.